Schematic of the working principle behind the temperature-sensitive polymeric gel microparticles. Credit: Nature. Researchers at MIT have devised polymer gels that are fitted inside double-pane windows, allowing or blocking near-infrared light from entering a building. The gel’s properties are regulated by temperature, so the whole process is automatic once a certain thermal threshold is breached. About half of all energy used by households in the United States is used for heating and cooling, so this kind of technology could have a tremendous impact on energy efficiency if adopted on a large scale. When it gets too sunny outside, most of us use blinds and curtains to keep things inside a bit cooler. 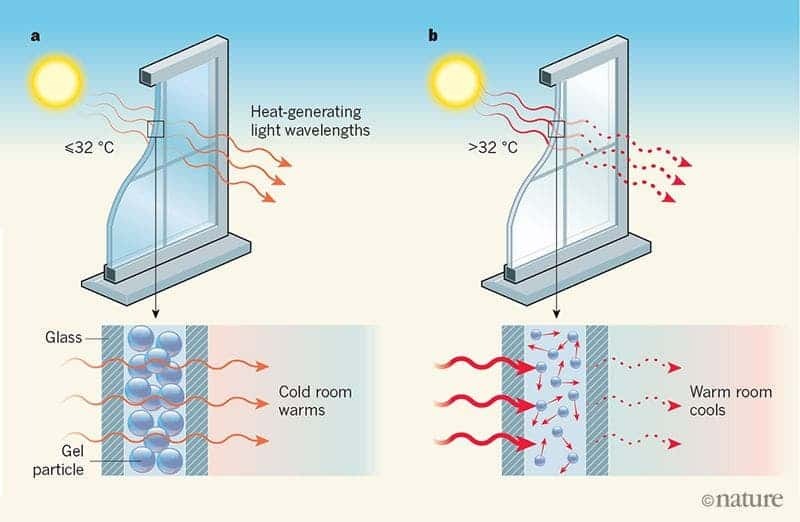 In order to remove the human factor (and make cooling a home or office more energy efficient), some engineers have devised electrochromic windows, which darken when a small electrical potential is applied. You’ll find such windows on a Boeing 787 Dreamliner, for instance. Typically, electrochromic windows require a human to activate a switch, although some applications allow the windows to darken automatically in response to temperature read by a third-party sensor. The problem with electrochromic windows is that they are quite expensive, not very durable, and have inconsistent light-blocking properties. There are, however, windows whose light-penetrating properties are tuned directly by temperature. Previous attempts involve films of vanadium dioxide, a thermochromic compound with sunlight-modulating properties. Its main drawback is that it becomes activated at temperatures in excess of 90 °C, which makes it impractical for real-world use. And when they’re not activated, they only allow little light to come through, having a transmittance of around 50% (semi-opaque). Researchers now report a novel thermochromic system that is a lot more reliable than previous demonstrations and might actually be practical for widespread use in homes and offices. The smart windows developed by the MIT researchers are based on polymeric gel particles (microgels) trapped between two glass panels. These gels have an extremely uniform density and a structure that forces the particle to swell in water in response to temperature. At 25 °C, the microgel particles have a diameter of 1.4 micrometers, scattering very little light and making the window highly transparent. Above 32 °C, the microgels collapse and expel water, scattering light in the infrared red range (the kind we perceive as heat). In experiments, the researchers showed that their system achieved an infrared transmittance of 81.6% in the inactivated transparent state, but only 6% when activated. As a result, the temperature inside a test chamber fitted with microgel-based smart windows had a significantly lower temperature compared to a chamber fitted with standard double-pane windows. The smart windows had no noticeable loss in performance after switching between states more than 1,000 times. They’re also not affected by freezing. Finally, the microgels and window assembly are not prohibitively expensive, making the technology promising for real-world applications. The major drawback is that once activated, the gels make the window relatively opaque because they also scatter ultraviolet and visible frequencies in the spectrum of light. Another drawback is that in the evening, because it’s cool outside, the windows remain fully transparent, reducing privacy. The whole idea is to stop using curtains, so as they stand today, these sort of smart windows may not be practical in all situations. The system was described in the journal Joule.